Concise history of the Roman legionary; his weapons, training, skills, as well as significant triumphs and disasters in battle. The might of Rome rested on the back of its legions; the superbly trained and equipped fighting force with which the imperial Roman army conquered, subdued and ruled an empire for centuries. The legionary soldier served for 20 years, was rigorously trained, highly equipped, and motivated by pay, bonuses and a strong sense of identity and camaraderie. Legionaries wore full body-armour, carried a shield which could be used defensively to form a shield wall or a tortoise, or it could be used offensively to punch at opponents and throw them off-balance in close-quarters fighting, as well as two javelins, a sword, and a dagger. In battle they hurled their javelins and then immediately drew their swords and charged to close combat with the enemy. They were the finest heavy infantrymen of antiquity, and a massed legionary charge was a fearsome sight. Many legionaries had rural backgrounds; they were considered hardy with higher levels of endurance. This was needed to cope with incredibly tough training, during which recruits had to march first 29 km in five hours, and then 35 km in five hours with faster steps - all the while carrying a backpack that weighed over 20 kg. The slower ones were severely beaten by centurions and officers with their staffs. They were drilled in battlefield maneuvers, signaling and weapons handling, with faux swords and shields that were twice as heavy as the real ones, to acclimatize them to the exhaustion that could happen in the heat of battle. 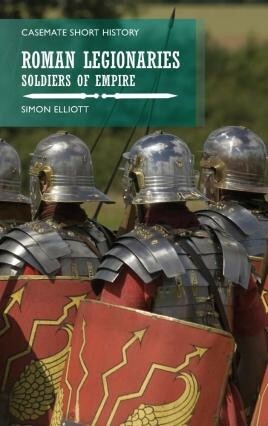 This concise and entertaining history of the Roman legionary covers their history from the age of Augustus through the heyday of the Roman Empire. Topics include training, tactics, weapons, the men themselves, life on and off the battlefield as well as significant triumphs and disasters in the great battles of the era. It's a handy, pocket size guide to the Roman military.